Whip the eggs and add the salt. Heat the oil in a pan and sauté the ham with the vegetables. After 5 minutes, add the whipped eggs to the ham, carrot and pea mixture. Lower the heat and cover the pan. Use a spatula to softly unstick the borders. Flip the frittata when it browns on one side and let it cook on the other side. Serve on a dish to later cut into individual portions. To save even more time, use canned vegetables. 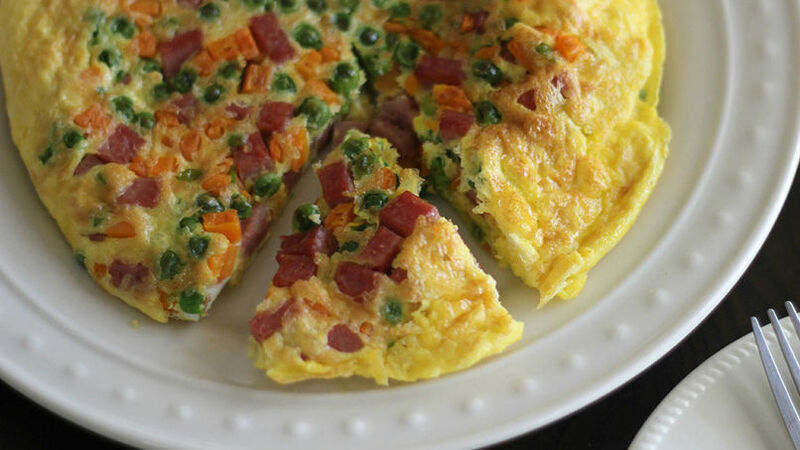 If your kids refuse to eat vegetables, this frittata can be the solution to your problem. I like making frittatas at home frequently because it’s the best way to use leftovers from dinner. This recipe can use your favorite ingredients and even add pieces of meat, chorizo and chicken. However, the combination of ham, carrots and peas is great and even the pickiest eaters will love it. This is one recipe that should definitely stay among your favorites for its low cost, simplicity and minimal time for preparation. Enjoy!